There's no better way to enjoy your porch or patio than with a nice afternoon sipping your favorite drinks, and enjoying time with someone you love. Make this your reality with our beautiful handcrafted Poly Porch Rockers and set the trend for the rest of the neighborhood. The classic slat back Mission design is simple enough to complement any outdoor decor, but offers enough style to provide just the right touch to your space. The curved seat provides the perfect ergonomics to leave you and your loved ones rocking comfortably for hours on end. These handcrafted rockers are built from an eco-friendly post-consumer material that utilizes recycled plastic - keeping this waste out of our landfills and turning it into outdoor furniture that is beautiful, comfortable, and durable. Choose from an array of vibrant colors, or combine two of your favorite, and rest assured that those colors are there to stay. 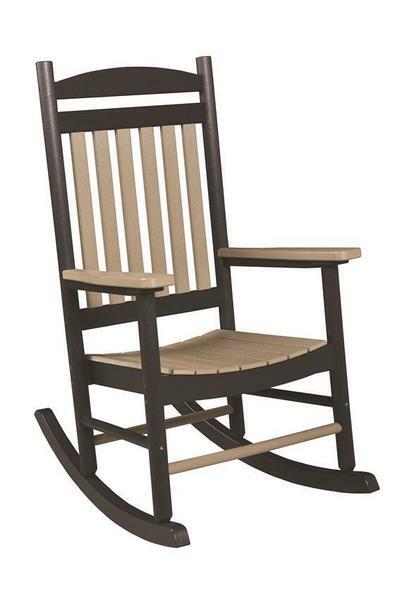 With a uniform color throughout, your new rockers will not chip, crack, rot, or develop mold. Leave it outdoors all year long without the routine maintenance of traditional wooden rockers and spend your time enjoying the outdoors. Back by a 20 Year Warranty for residential use, these rockers will last decades. Invest in your outdoor oasis with the best furniture available - DutchCrafters Poly Furniture. *Custom Two-Tone Colors Are Available Upon Request. Additional Charges May Apple. Please Call for a Custom Quote.